Senate Bill 200, overhauling Kentucky's juvenile code to achieve better outcomes for kids and save taxpayer money in the process has seen final passage in the Senate. Following original Senate passage at 32-6 and House passage of 84-15, the Senate concurred with minor changes made in the House Judiciary Committee and voted a final time 30-8, sending the bill to the Governor's desk. Big, comprehensive reforms take a Herculean effort. I didn't have a full grasp of that truth until today. Under the best of circumstances it still takes time to get input from all stakeholders, shape the policy draft, vet the policy through stakeholders again (rinse and repeat) until you finally have a bill to file. After the bill is filed the other legislators have to be brought up to speed on the topic enough to make an informed decision to support it with their vote. These two steps alone make up the bulk of legislative effort. Senate Bill 200 was not an example of "the best of circumstances." Indeed, because the bill touches all three branches of government, two Executive Cabinets and multiple departments within them, and was the largest overhaul in three decades. We were bound to run into reluctance to change, and we did. Having said that, there is an important thread that you can find throughout the fabric of SB200: the will to change. Still more important is the motivation for that will, the best interest of Kentucky's children. We (myself included) had to dig down, to tap wells of patience, calm, energy and concentration. The official jacket of SB200 moments after enrollment in the Senate, bearing the signature of Senate President Stivers before heading to the Speaker, then the Governor. I may eventually provide a more detailed story of just what exactly we had to go through, including absurd email blasts accusing the bill, and me as it's sponsor, of being a "Trojan horse" for the United Nations (I'm still stunned by absurdity of that one). 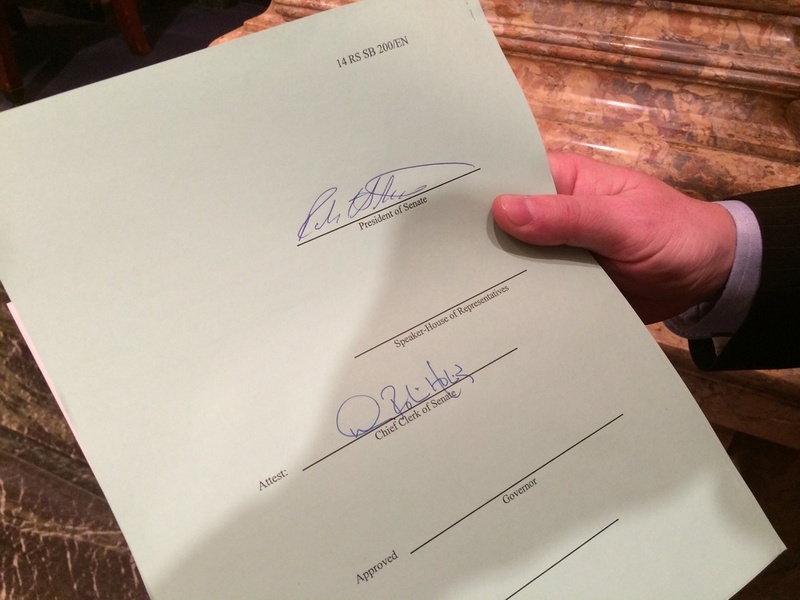 I will simply and proudly report that the bill has seen final passage, and as of this writing, already sits on the Governor's desk awaiting his signature.